We may send a link to you from within our help widget. Some users have reported getting a message similar to the one below when attempting to open it. A tweak to your Windows registry setting should allow you to get these links. If you still receive errors just make sure to tell us and we'll email them to you instead. We found this solution on slipstick.com. A summary is below and a direct link to their article is here. The Default value above will open the link in a new browser window. 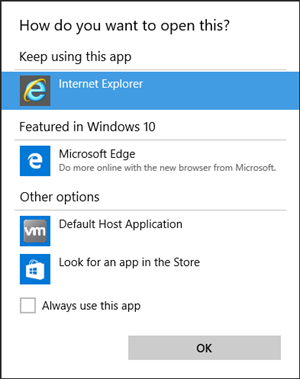 If you want to use a new tab in an open browser, use cmd /c START "C:\Program Files\Internet Explorer\iexplore.exe" "%1" instead.